Charles and Ray Eames were very clever at creating designs that were versatile enough for them to be used in a multitude of settings. This was evident with the Eames desks and tables where many were as good at home as they were in the busy bustling office. Charles Eames only designed one Eames desk for market release, in 1950, and this was possibly because Herman Miller’s catalog was already producing workplace furniture from George Nelson and Associates. Into the late 1950’s and beyond and the market for workplace designs was growing rapidly. The Eames Office fulfilled this need by designing tables versatile enough for the home or the office along with an intelligent system of custom conference tables. The Eames Desk Unit (EDU) was a beautiful and elegant combination of natural plywood tops, colored panels and chrome plated structural frame. Released in 1950 it matched perfectly with the Eames Storage Units (ESU) and could be deployed into home or work offices. This Eames desk had two available sizes of 45 or 60 inches and with either colored or neutral panels. Each was then finished in either the popular chrome plated or black painted frame. The frames of the EDU desks had a strong resemblance to the Meccano building toy, invented in the UK in the late nineteenth century. The thin angled metal sections were bolted together and strengthened with wire struts for support. 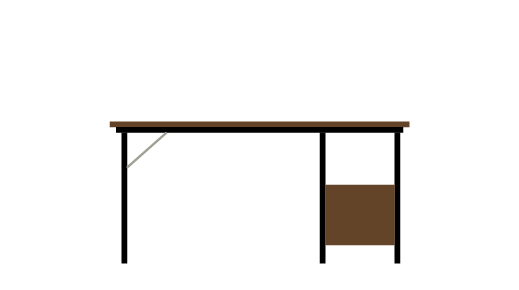 The EDU Eames desks, despite the popularity, were discontinued in the late 1950’s until they were revived by Herman Miller in 1994 with the re-release of the home classics. It would be the best part of a decade before further designs of Eames desks and tables would be produced. With the market expanding rapidly, Herman Miller sought to fill this need with designs from the Eames Office as well as established ranges from George Nelson and Associates. What followed was a series of extremely clever Eames desks which were all imbued with the purpose of having customization and the ability to be entirely versatile. 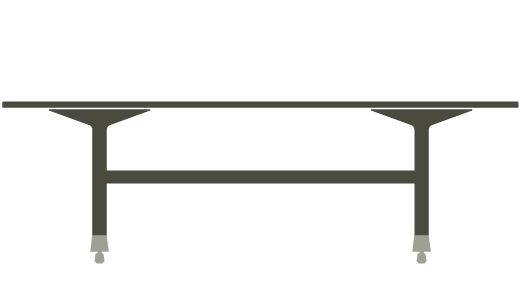 The Segmented Table range was one of the most intelligent table systems, perhaps ever invented. A system of interchangeable leg sections, bars and extensions meant that the base system could be deployed in various combinations to create anything from small top tables through to large scale Conference Tables up to twenty feet. The base system was so clever that it could go in any direction, creating length and width for long, very long or very wide tops which would be available in either natural veneer or plastic coated colors. 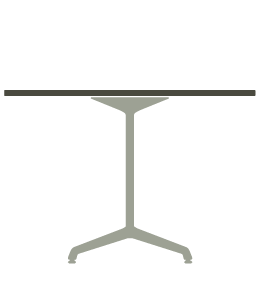 The Segmented Table became a popular workplace choice and were available in circular, square, rectangular or oval shapes. There was another range of conference work tables designed and marketed for a short time during the 1960’s. The 2500 Series was different from all the other table ranges the Eames Office produced as it had parallel legs on each end as opposed to those with central stems. The polished legs set against the natural veneer resulted in a beautiful design yet the series was not a commercial success and was sadly discontinued. 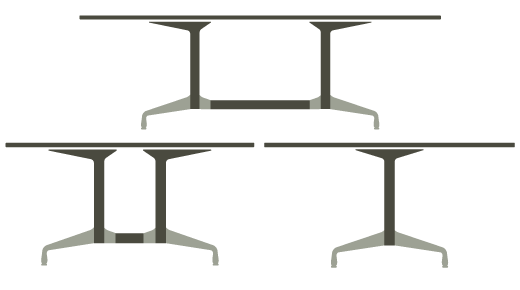 To match the chairs of the Aluminum Group released in 1958 were the tables that became known as the Contract Base Tables. 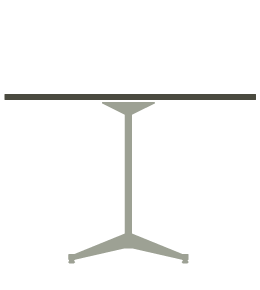 These super versatile tables were a perfect match for the range and were intended, once again, for use at home or the professional workplace. The range was a big commercial success and developed over the years into a best seller as a versatile table option. Just like the Alu Group chairs, the tables too had a change of base in the mid 1960’s with the introduction of the Universal Base. The Universal and Contract based tables were available for a considerable time alongside each other until, like the chairs of the Alu Group, the Universal based variant superseded its forerunner.